Fujitsu Laboratories Ltd. today announced that it has developed technology that by analyzing a program can partition internal structures so as to simplify modification of complex business applications. Conventionally, business applications that repeat revisions due to maintenance or the addition of new features often have internal structures that become complex, and any modifications can have wide-ranging ramifications. As a result, modifying applications in response to business changes is an enormous burden. 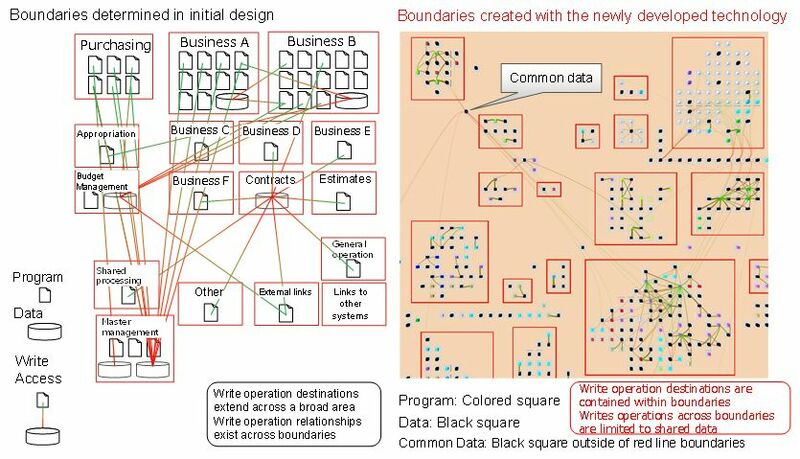 In order to partition a business application into each of its functional components, Fujitsu Laboratories has now developed technology that analyzes the dependencies between programs and data, and then identifies boundary candidates that would partition the program in a way that decreases the mutual dependency. Using access logs to the database when the application is actually run, Fujitsu Laboratories also developed technology that, from among the boundary candidates, finds an area of the program that should be executed as a series of operations, and then finds those areas where the business relationship is highest. By enabling the visualization of the program’s boundaries that partition by function, it is possible to partition applications in cases that this had previously been difficult to achieve. As a result, by adding revisions or upgrades that localize the changes based on the boundaries, it makes it possible for customers to quickly respond to changes in their operations or business. In the digital transformation of business using ICT, there is now a need for technology that facilitates rapid modification of existing business applications. In the manufacturing or retailing and distribution industries, for example, it is frequently the case that new locations are added or that there are changes in business partners, and when these changes occur, there is also a need to change the business applications themselves. Up until now, however, it was often the case that the structure of business applications was complex and changes had far-ranging impact, which required significant man hours of time consuming revisions. To resolve this problem, as a method of designing applications in which business processes can be quickly changed, in recent years there has been considerable interest in microservices(1) , which are structured as multiple services, each of which runs independently. When parts of a program that frequently change are structured to be independent, as is the case with microservices, it makes it easy to deal with changes simply by replacing the services affected. For applications that have undergone repeated rounds of maintenance and feature additions, the program dependencies and the data dependencies become quite complex, and it is frequently the case that parts of the program can be affected that were not even envisioned in the original design, making it difficult to partition existing applications into a structure in which there are few dependencies. As a result, when trying to partition a program to localize the affected areas, it was necessary to make revisions while investigating many dependencies. 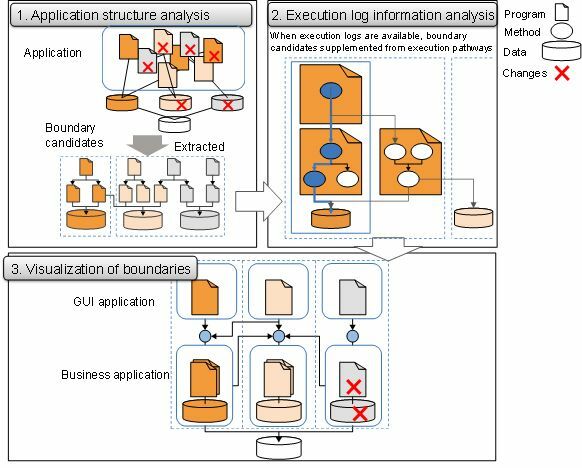 Fujitsu Laboratories has now developed technology to automatically identify boundaries that can partition the internal structure of business applications by function, using the program source code and database access logs as inputs. This process of the technology is as follows. When partitioning an application, this technology analyses the structure of the application, arranging the data in a way that minimizes the number of dependencies, and, in particular, extracts boundaries that minimize mutual write operation dependencies. Beginning with a program called from outside the application, or a specified program, the technology defines groups that contain all called functions. Then the program weights the relationships between them, based on the idea that program groups that write to the same business data have a deep relationship with business data, and extracts areas that are surrounded by boundaries (Figure 1-1) using a clustering technology developed with Fujitsu Laboratories' proprietary application structure visualization software map technology(2) . At the same time, data that is written to by many program groups is split off as common data. When database access logs collected when the program actually runs are available for use, the technology identifies areas where operations ought to be executed as a series, supplementing the results obtained in the first step. In analyzing execution log information, the technology extracts database access commands as operational logs for the business application being run, extrapolates data access commands that, operationally ought to be executed in series, and identifies the programs corresponding to those commands (Figure 1-2). Using this information, the technology extracts areas of operations that ought to be executed as a series. This technology uses software map technology to visualize the results of the first two steps (Figure 1-3). The visualization places areas with a strong mutual relationship close together. By using this technology to identify boundaries with few dependencies, it has become possible to partition applications with a reduced number of man-hours. For example, in a test using applications from a purchasing department, the boundaries obtained from this newly developed technology (Figure 2, right) reduced mutual dependencies to less than about 15% compared with boundaries based on the categories established in the initial design (Figure 2, left), which resulted in a reduced burden of investigation and modification when partitioning the program. Using these results, revisions and improvements can be made to applications that localize the changes, while still considering business relationships and update frequency, enabling rapid response to changes in customers' businesses. In addition, this technology enables customers to more efficiently consider which parts of their business applications to shift to microservices or migrate to the cloud in stages. Fujitsu Laboratories will continue to test the application of this technology to the analyzing of business applications for a variety of industries, with the goal of commercializing this technology in fiscal 2018. A method in which a service as a whole is not developed as a single unit, but rather structured as multiple independent services which operate while communicating in a lightweight format.